One of the things I try to save room for in my suitcase when returning from Italy is olive oil, preferably nectar from the place or region I’m visiting. It’s a way to bring back, literally, a part of of the place where I’ve been staying, because it comes from the fruit of trees growing there for hundreds, maybe thousands, of years. The other reason I bring it back is because it is, in general, vastly superior to what passes for olive oil here in the United States. Now, I am in no way an expert or even semi-proficient on the topic olive oil, but I’ve learned a few things during my travels in Italy and feel comfortable sharing a few nuggets with you, kind reader of my blog (and hopefully follower on Twitter: @auntjaneinitaly), that you might find useful. Who could resist marketing like that? We were greeted by a shopkeeper who immediately pressed small cups of green, fragrant oil in our hands and implored us to taste; It was like nothing I ever had before. And then we were offered small samples of his balsamic vinegar. Our minds were blown and we had to have more. The shop owner, who was named, I’m not making this up, Francesco, lectured us for at least twenty minutes about the virtues of Umbrian oil, his years in Chicago, the difficulty of meeting women in a small medieval town filled with monks, and a variety of other topics. Over the course of the month, we returned to his shop, this Timothy Leary of the olive and grape, to stock up on his great products; we were hooked. So what’s so special about the olive oils I’ve had in Italy? First, they are distinctive and aromatic, each with unique characteristics — grassy, spicy fruity, peppery or buttery and floral. In fact, it’s likely you’ll find a bottle of good olive oil on your table in restaurants and homes in Italy. The custom is that it can be used like a condiment/sauce/dressing, and poured onto foods after they are served, to enhance their flavor. In addition to drizzling olive oil onto toasted bread, I’ve been encouraged by Italian waiters to pour it on already grilled fish. And while attending the Awaiting Table cooking school in Puglia this Fall, we grilled vegetables on barely oiled pans, and poured olive oil on the veggies, after they were cooked and served; it really enhanced their flavor. 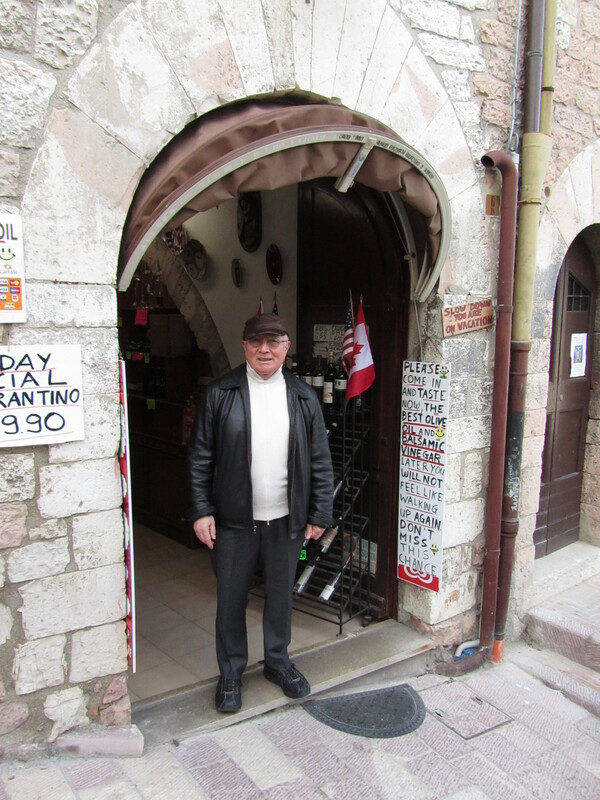 In addition to my bagman Francesco in Assisi, I’ve encountered no shortage of authorities on olive oil in Italy, and why the olives from their particular region are far superior to any other place on earth. The issue of fraudulent and inferior olive oil is vast. So if you want to dig in more, visit Olive Oil Times, a great site that covers a wide range of topics about olive oil. And here’s a great little video that helps to show what’s so special about Italian olive oil. Just like the patriarch of the Beverly Hillbillies, you too can find great sources of oil if you are armed with a few basic tips. Learn what good olive oil tastes like. Visit your local gourmet food shop or purveyor of fine food products and ask if they conduct olive oil tastings. Sur La Table, Williams-Sonoma, Whole Foods, and chain gourmet stores often conduct tastings. Select an oil that says “cultivated, pressed and packaged in Italy.” If it doesn’t say that, it could be an indication it’s an inferior blend. Of course, Spain, Greece, France and other countries produce great olive oil, too. What’s important is the single source. Look for “DOP” on the label (denominazione d’origine protetta or protected designation of origin). Basically, it indicates that the oil comes from the olives grown in the region designated on the label, and is produced according to the standards of the region. Inspect the label closely for a date that tells you when the oil was made and/or when it expires. Olive oil is literally juice from olives. The fresher, the better. Would you want a glass of Tropicana orange juice made 3 years ago? To get the freshest oil, you might want to go local, which isn’t easy to do if you live in Brainerd, Minnesota. But you might want to try oils from California, for example, if you live in the U.S., using the same tips provided above. If you don’t have a good shop locally, try shopping online. Look for sites that give you a close up of the label, or detail the important facts listed above. The same care you take in selecting an olive oil also needs to go into how you store and keep it. Heat, air and light are olive oil’s natural enemies. So, pick a cool, dry dark place in which to hide your stash. Because olive oil does not age well, I buy small bottles of oil so that I replenish my supply with fresh oil regularly. Ideally, once you open a bottle, you should use it up within a few months. Want to know more? The interweb is full of information. As mentioned earlier, OliveOilTimes.com is a great place to start. La Cucina Italiana magazine’s web site also has a great olive oil guide. One thing I do know for sure though, the best way to start finding out about good olive oil is to start tasting! I am checking my evoo right away! Olio Beato passes the test! My word you certainly do your research!